Just admit it. The first time you saw the Samsung Galaxy S5 you said to yourself, "You know what would make this phone even better? If it ran iOS!" Then you posted that priceless thought on Twitter and someone replied telling you that it would be much more awesome if Samsung unearthed Sense 3.0, the one that was announced with the HTC Sensation back in 2011, and put it on the Galaxy S5. Then you two hit it off with an amazing back-and-forth banter until you decided that the deal would be sweeter if the phone wasn't even an S5, but an S4, and it was free. With frugality in mind, you had your first date at the local Burger King and the rest, as they say, is history. Either that really happened to the person (or team — but I hope for humanity's sake that not more than one of our ilk was involved in this) behind this Burger King campaign or... Well, I don't know how else to explain how this many mistakes can creep into one ad. 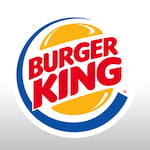 The real story goes like this: Burger King has a new app for Android. It isn't particularly good, but let's not dwell over that — there are more important things to discuss than app design guidelines, dammit! 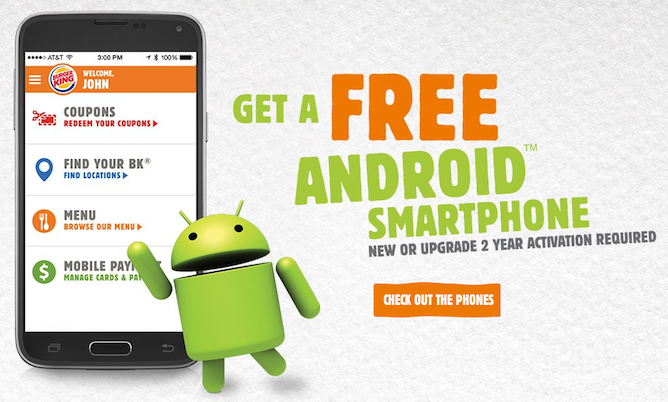 Burger King wants to encourage the use of said app, so it came up with a promotion where you can get a new phone for free with a new or upgraded 2-year contract if you use the app. All's good until the person in charge of the promo's visuals gets involved. 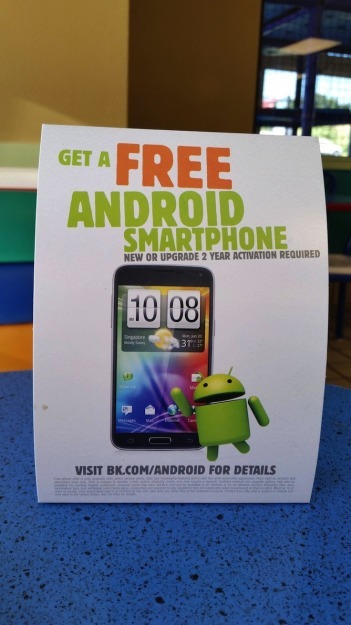 Strike 1: As spotted by Redditor DucoNihilum, the printed material displayed in Burger King's restaurants has a Samsung Galaxy S5 running HTC Sense 3.0. Not all of us like TouchWiz, but ser'sly guys, Gingerbread? Strike 2: The promo's website uses the same Galaxy S5, except now it is magically capable of running Burger King's iOS version of the app. It is also on AT&T — this will be relevant in a bit, trust me. Strike 3: If you head to see the list of eligible phones for the promo, there isn't even a Galaxy S5. There's a Galaxy S4 though and a bunch of other midrange phones, only on Verizon and Sprint. We know that all Galaxy phones look alike and operator contracts aren't cool, but for the sake of the ad, one would assume that a 2-minute research on the Internet could have avoided us this entire mess. The link to the Burger King app is below, in case I made you hungry and you really really really love your Whoppers so much that you're willing to let this travesty slide. I'll just shake my finger judgingly at you from afar.